The World Foresight Forum, a new international event, will bring together world leaders from business, government (including the worlds leading Security Ministers) and academia to specifically address a broad range of global challenges which taken together are increasingly affecting our global security. Topics covered include power shifts, cyber security, resource scarcity, changes in demography, climate change and the breakdown of the financial system. The Forum founders believe that we can successfully adapt to these challenges only if world leaders from business, politics, science and the military, who have thus far not engaged one another sufficiently, come together to address the issue of security in the broadest sense of the word. The purpose of the World Foresight Forum will be developing and delivering from the Forum future Roadmaps which will outline solutions to the global challenges the world is facing today around security. We invite you to participate in the discussion! 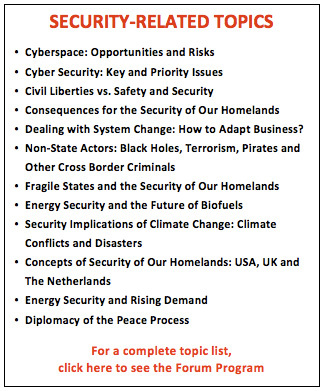 The summit will bring together prominent world leaders (including the world’s leading Security Ministers) meeting to brainstorm in a series of moderated presentations and plenary sessions. Cutting-edge foresight studies and research papers will form the initial input for these sessions. Sponsoring companies and organizations have an opportunity to showcase what they stand for, how they see the future, and the contributions they can make in working towards a more secure future. or call in the United States 415-425-7124. *You may be eligible for a 20-30% discount if you qualify as a corporate executive or thought leader in a specific area.